I think July is the hottest month of the year in Florida. And it sure feels that way, although September can be baking-hot too. The wardrobe solution for me is to wear airy skirts, made of cotton or linen, and to let my toes hang out. Florals and stripes are my favorite summer prints, so why not make a marriage of them? The hair is the Wiki by Ellen Wille. I cut some of the cap out at the nape to make it a little cooler. I added a small silk Missoni scarf, bought at the original Filene’s basement about 20 years ago. I loved that place! The sandals are the Mirabelle by Sofft, super comfortable. When the slight breeze catches your hem, ahhhh. be capable of truly take valuable information concerning my study and knowledge. I love your skirt. So pretty, and the scarf was a great touch! I love the stripes with the florals. And the shot of you with the wind-blown flounce is so good. It may be friggin’ hot but you look cool, Patti. Thanks for the linkup! Love that you paired a striped top with your floral skirt Patti, the perfect mix. Thank you for the link up!! Can’t beat a swishy skirt and shirt in hot weather. The floral is so pretty. Many thanks for hosting Visible Monday Patti. Woo! It’s been hot here too! I also love a big full skirt in hot weather, and a long-sleeved shirt – it’s practically my uniform! Thanks for the link-up, Patti! You rock! Such a fabulous skirt! I love your neck scarf too…very chic! Thanks for hosting, hope you have a great week! I was in Michigan and nearly died from the humidity—July is definitely the hottest month, but looks like you’re beating the heat in style! Love those sandals Patty! These look simiilar to Eileen Fisher pair I have seen too. 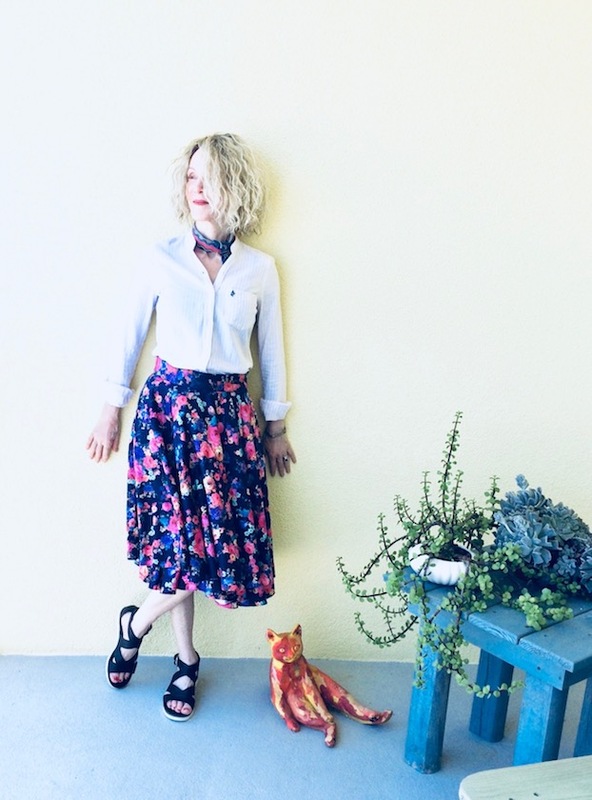 Pretty skirt and LOVe your neck scarf! looking lovely! and yes the heat is nearly unbearable here in the South! Your skirt is totally gorgeous dear Patti, love it! Thanks for the linkup! Thank you for hosting. I am also in FL and taking a couple of photos outside right now, is almost too much! 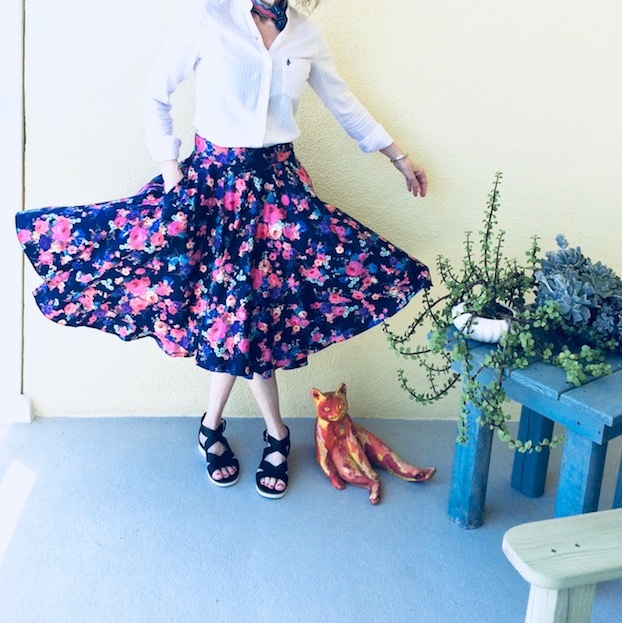 Great minds my friend…there’s nothing like a flowy floral skirt to survive the summer heat! I love that top and scarf with that skirt! Such a great look! Love this outfit Patti! Anytime stripes and floral are in the mix I am a fan – also loving the scarf and those shoes look so comfortable! So pretty, Patti! I always love a full skirt with a crisp button down. It is so Diane Keaton and she is one of my favorite style icons ever! You look gorgeous, my friend. Stay cool! That skirt is beautiful. I used to look for skirts that moved back when I was into ballroom dancing. It’s so fun to swish! You look cool in your outfit Patti! You’re wearing florals and stripes and my dress is florals and polkadots in my latest post. Love skirts and dresses on hot days. We’re having Florida weather up here in Ontario. I also love the mix of stripes and florals, and adore anything that sets me into the twirling mood! Stay cool ! Skirts are definitely my item of choice when it’s so hot outside!! And this one is perfect with so much Patti!! I love that skirt!! Also isn’t it fun to wear things like that scarf that you got so long ago?! I’m all about skirts in the summer, Patti! And I’m really starting to love ModCloth too! That’s a great wide skirt! I don’t know why I hardly ever wear white blouses. I think they look cool on others! I find dressing for hot weather challenging, nothing feels right (or, rather, everything just feels too much). Your skirt and shirt combo looks comfortable and cute, though.